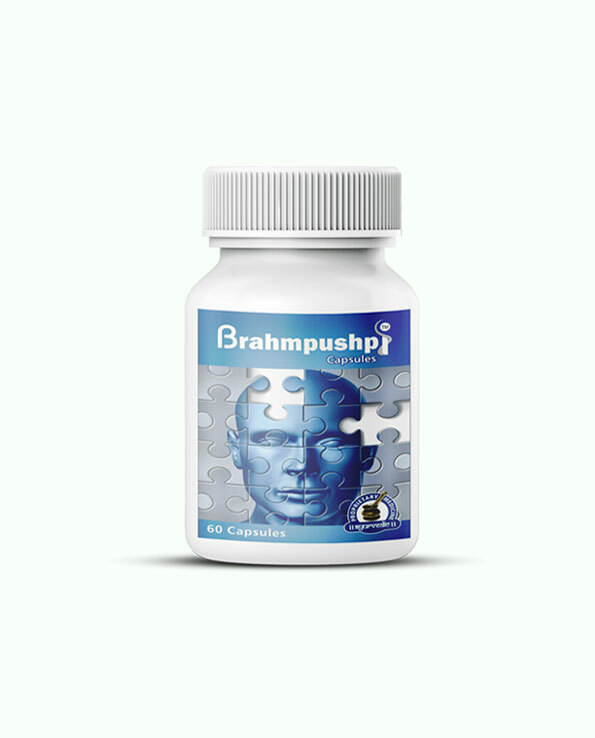 Brahmpushpi capsules are powerful ayurvedic brain power pills that improve memory, provide mental clarity and remove mental cloudiness and nervousness. 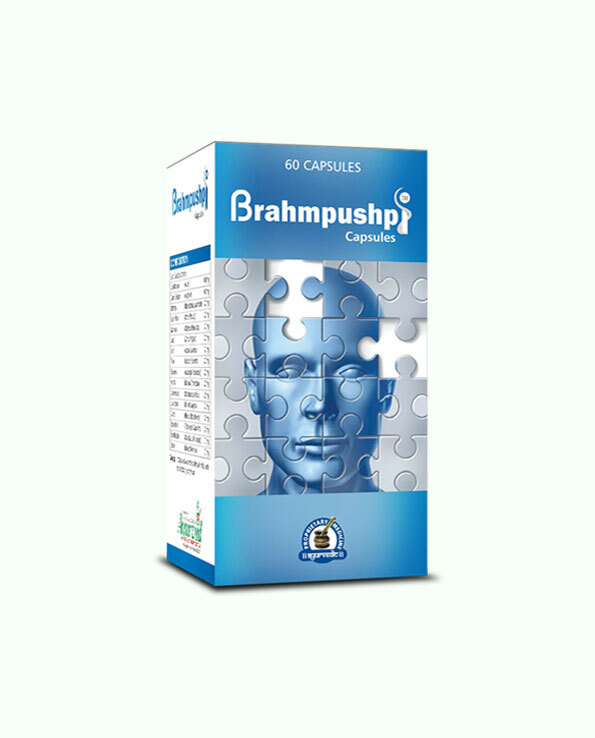 Brahmpushpi capsules are ayurvedic brain power capsules designed to provide and maintain sharp and alert mind for longer period in life. These ayurvedic brain power capsules are powerful supplements to improve memory and brain power by protecting cells from toxin damage, malnutrition and hormonal imbalance. 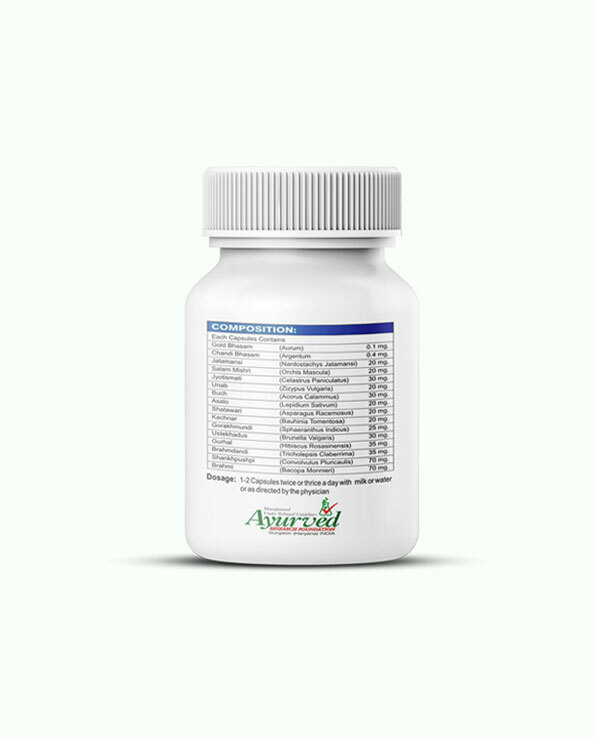 The herbs present in these ayurvedic brain power capsules are renowned for enhancing mental faculties of young children and adult males and females. 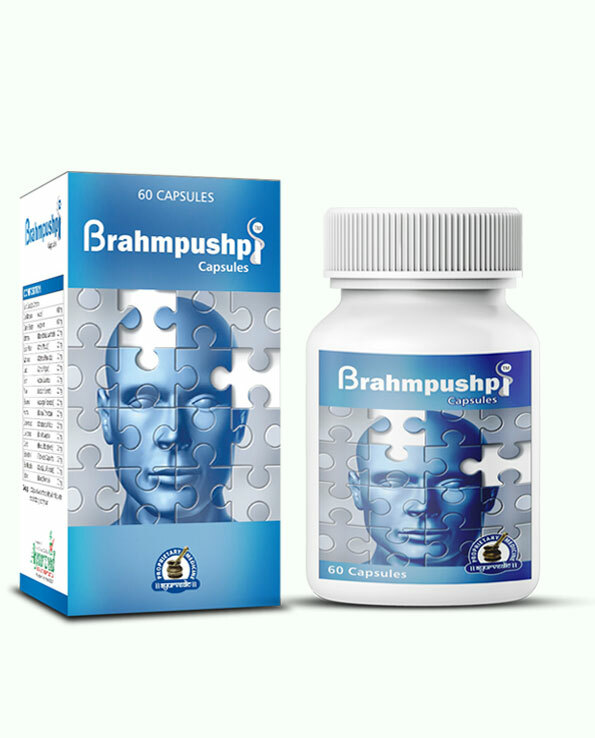 Brahmpushpi capsules maintain sharper memorizing power, recalling power and abilities to analyse faster, these also provide mental alertness and clarity and treat and prevent psychological disorders like anxiety, depression irritability, emotional disturbances etc. effectively. 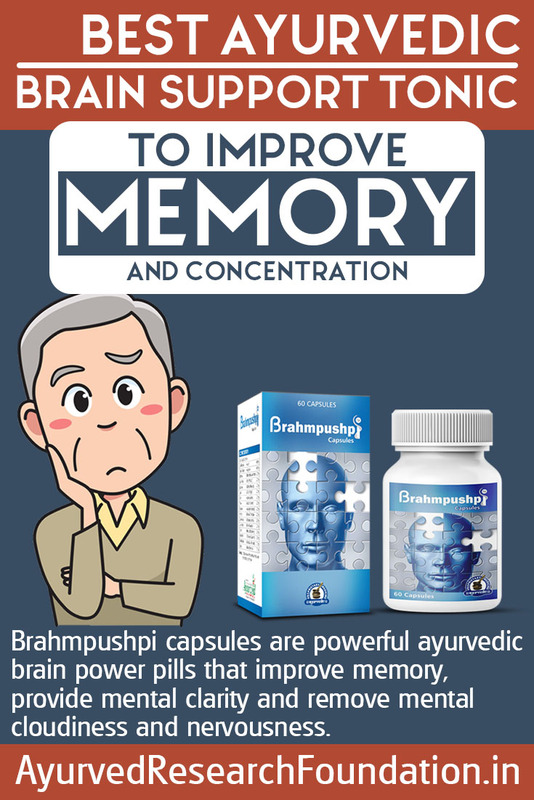 Brahmpushpi capsules possess herbs which protect brain cells from damage due to presence of toxins in blood, these herbal memory enhancer pills sharpen memorizing abilities by improving neurotransmission between brain cells and keeping them protected from damage. Herbs present in these herbal brain enhancement pills promote functions of both parts of brain in proper balance to improve mental faculties. These ayurvedic brain power capsules make mind sharper and compound grasping power to improve performance of students, professionals and others in their respective fields. Some of the herbs used in Brahmpushpi ayurvedic brain power capsules promote healthy nervous system and provide mental clarity and remove mental cloudiness and nervousness. These herbal brain enhancement pills improve focus and concentration to enhance understanding and analysing powers and make memorizing and recalling easy. These ayurvedic brain power capsules suppress ill-effects of diet, lifestyle, genetic problems and bad habits which deteriorate mental abilities; these herbal memory enhancer pills improve memory and brain power even in elderly individuals and work well for keeping women mentally calm and collected who are passing through menopause. Brahmpushpi capsules possess herbs which maintain and promote healthy hormonal balance. These herbs enhance secretion of health promoting hormones which guide flow of energy towards brain and keep it free from lethargy, stress and mental fatigue, and also keep it relaxed and fresh. These herbs bring sound sleep, and rejuvenate cells and increase neurons to empower brain at any age. These ayurvedic brain power capsules prevent distractions and also nullify ill-effects of long term treatment and use of sedatives or tranquilizers. These pills provide effective protection from amnesia, hypertension, and deadly conditions like Alzheimer’s and Parkinson’s. These pills work as highly beneficial herbal supplements to maintain mental sharpness, alertness and memorizing abilities for longer period in life. Brahmpushpi capsules are 100% safe supplements for men and women of all ages. These possess herbs in purest form and pass through strict production process which leaves no chances of contamination. No artificial substance is added in these pills which make them completely safe even after prolonged use. Brahmpushpi capsules contain wide range of herbs in perfect blend. The ingredient list goes as – Gold Bhasma, Chandi Bhasma, Jatamansi, Salam Mishri, Jyotishmati, Unab, Buch, Asalo, Shatavari, Kachnar, Gorakhmundi, Ustekhadus, Gurhal, Brahmadandi, Shankhpushpi and Brahmi. These herbs are renowned since ancient times for providing wonderful benefits in empowering brain and improving its functions considerably. These herbs enhance focus, memory, grasping power, analysing abilities and memory recall in person of any age. These are excellent for gaining mental relaxation and stronger emotional status. Using these pills is easy all you need to do is regularly consume one or two pills of these after meals with water twice in a day. Avoid misses and use these for required duration for faster results. These pills do not require any strict regimen to provide positive results. One should use these for considerable duration with patience to gain maximum benefits. Generally 4 moths use is sufficient for gaining positive results but in people suffering with mental sluggishness due to severe causes may need to use these for 6 months. Eat fibrous and nutritious diet. Avoid stimulating foods and drinks like excessive spices, beverages, caffeinated drinks, alcohol, smoking etc. completely. Take proper rest and sleep and avoid stress by exercising regularly. There are quite a few simple methods for making payments. You can pay us on delivery in India and also deposit cash in our account. Or you can send us cheque, DD or transfer through NEFT. We ship our products through FedEx to ensure timely delivery. Products will be delivered in a discreet packing to protect your privacy ad these will be hand-delivered right at your doorstep. We deliver within 3 to 5 working days anywhere in India. I was suffering from poor brain power since a long time so I ordered this supplement. I had seen a great improvement in memory and concentration. Those who are suffering from the same problem should give a try. My mother recommended this product to me so I ordered this supplement. This product helps brain work more quickly than before. Loved this product!! My wife was looking for a product to help keep her mind vibrant and alert. I ordered Brahmpushpi for her. She told me that this supplement has really helped in improving mental power. These supplements are awesome. I have actually tried many different pills like this but I just haven’t had good luck until now. But this works incredibly well for me. If you are looking for some high quality pills this is fantastic option. Amazing product!! Would recommend to all those who are having the problem in concentrating on the things for long. Very good and after using it for 2 to 3 months I found it useful. Superb supplements! Enhanced my concentration power and improved nervous system. This product helped me to develop concentration and focus. This is a great product, helped to cure one of my friend’s elderly mother, they thought she had dementia, but it was lack of proper brain nutrients, it really helped her. I purchased these brain power pills for my daughter. Her memory power has increased and her grades are also improved nowadays. I am hopeful for even better performance.